Interested in helping build the set for High School Musical? First meeting on Feb. 16 in Blackbox theater. Ongoing build dates will be every Saturday up until Mar. 23. SEUSSICAL T-SHIRT, PLAYBILL, AND POSTER DESIGNER NEEDED!!! 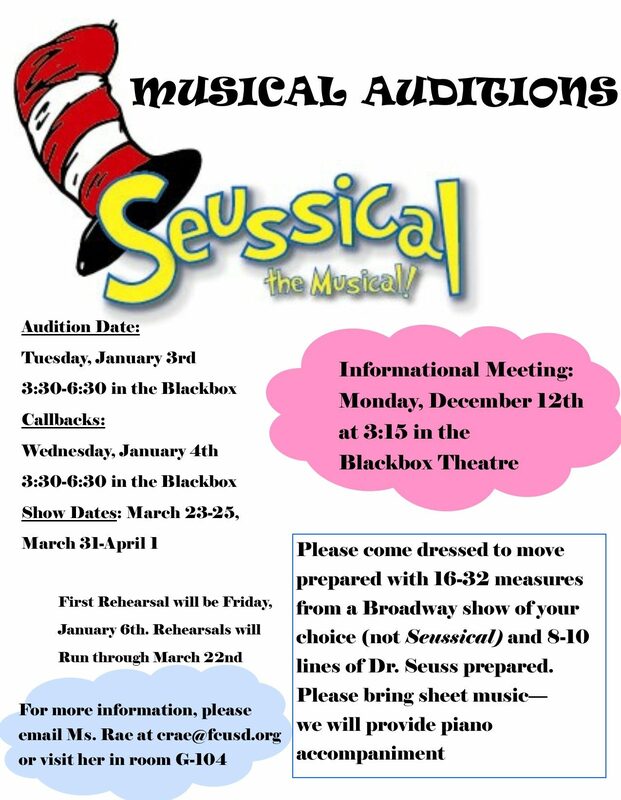 Would you like the opportunity to design the artwork for Vista Drama’s production of Seussical the Musical? If so, please develop a design for the show that would be used for production materials including programs, posters, and T-shirts. Vista Drama Goes to Ashland! This year, Vista Drama will be taking its second trip to Ashland, Oregon for the Oregon Shakespeare Festival. For more information, please come to G-104 on Tuesday, November 15th at 6:00 pm. See attached flyers for details on the trip – we will be collecting deposits on a first-come, first-serve basis. We are a 501(c)(3). Please contact Kyle Hadley for information about donations.